Trump’s Approval Rating Is Up. Republican House Chances Are Down. Does That Make Any Sense? Just in time for the Nov. 6 election, President Trump is posting some of the best job approval numbers of his presidency. His approval rating is currently 43.1 percent, according to the FiveThirtyEight average, the highest it’s been since March 2017. His disapproval rating is 52.0 percent, so let’s not get too carried away — the president is still unpopular. But his numbers are moving in the right direction. Republicans have been moving in the wrong direction in our House model, however. The three different versions of our model — Lite, Classic and Deluxe — each show slightly different results, but they all have Republicans at or near their all-time lows. GOP chances of retaining control of the House are down to 14 percent (about 1 chance in 7) in the Classic model, our default version. The Lite version, which is based on polls alone and doesn’t account for factors like fundraising, is slightly less bearish, putting Republican chances at 21 percent (about 2 in 9). But that’s still as low as they’ve been all cycle. The Classic and Deluxe versions of our model actually use presidential approval ratings in their calculation. But they’re a relatively minor factor — part of an initial projection the model makes based on historical data to calibrate its forecast early in the cycle. Now that Election Day is almost here, the historical projection plays little role. That’s because presidential approval ratings have a relatively rough relationship with midterm outcomes. More direct measures of voting preferences for Congress are more reliable. For example, the generic congressional ballot, which shows a Democratic lead of 8.6 percentage points, is bad for Republicans and has been getting (slightly) worse. And the large array of House district polls from Siena College and our friends at The Upshot have reverted back to being quite poor for Republicans after a couple of weeks in early October when they showed more bright spots for the GOP. Besides that, Republicans are doing about as well — or as badly — as you might expect given the long history of the president’s party performing poorly at the midterms and that Trump is at least somewhat unpopular. Our model performs a slightly-more-sophisticated version of this calculation; for instance, it attempts to estimate Trump’s approval rating among likely voters, which is slightly better than his overall numbers.2 Still, it thinks Republicans “should” lose the popular vote for the U.S. House by about 8.3 percentage points — again, very close to what the generic ballot and other indicators show. And the modest improvement in Trump’s approval rating doesn’t help that much; the calculation would show Republicans losing by 8.8 percentage points if we’d used the Labor Day version of Trump’s approval rating instead of his current one. The relationship between presidential approval and a party’s performance at the midterms has been stronger in recent elections. 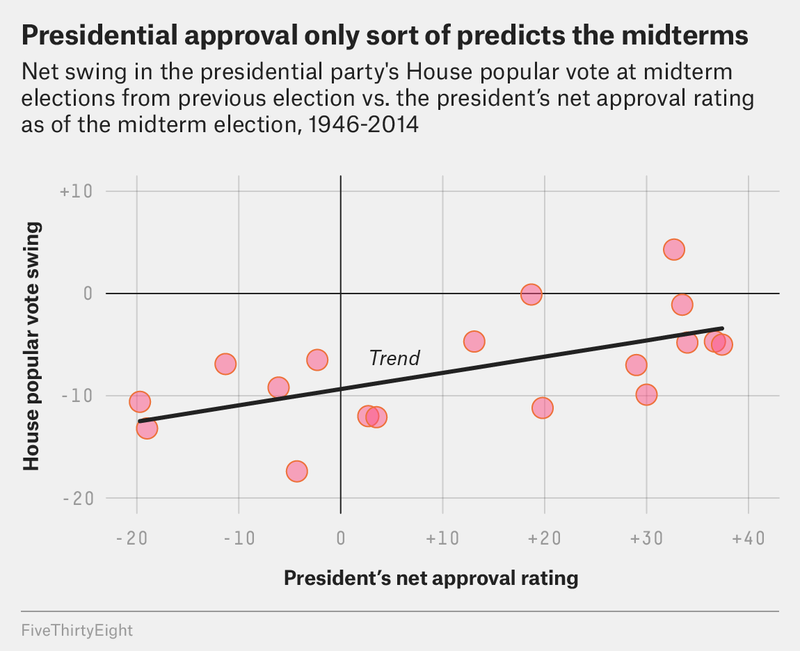 In the chart above, for example, the slope of the line would be almost twice as steep — meaning a clearer relationship between presidential approval and the House popular vote — if you’d only calibrated it based on midterm elections since 1994. But again, that isn’t a helpful set of facts for Trump. If we’d used only the most recent data, our model would show a worse projection for Republicans, because Trump is unpopular and unpopular presidents have been punished especially heavily by voters in recent midterms. In short, while it might seem a bit weird that presidential approval ratings and the generic ballot have moved in opposite directions, the data isn’t that hard to explain. The president’s party usually does poorly at the midterms even with a popular president, and Trump isn’t popular. His numbers are improved, but only marginally. Moreover, the relationship between presidential approval and midterm performance is rough enough that you wouldn’t necessarily expect them to move in lockstep. And Republicans aren’t doing any worse (or better) than you’d expect from historical trends. Maybe the Republican outlook in the House would be even worse without the recent uptick in Trump’s approval rating. But that outlook isn’t good, and while Trump is probably still a net liability for the GOP, Republicans have plenty of problems of their own making too. Granted, they happen to be 2 or 3 highly consequential points: With a 6-point popular vote loss, Republicans would have roughly an even-money shot of keeping the House; at 8 or 9 points, it’s much harder. At least in general; there are exceptions in some polls.